Regrettably, several of my friends and acquaintances have first-hand knowledge of Alzheimer’s. Recently, I’ve re-connected with Carol, a friend I’ve known more than fifty years. Well, I shouldn’t say we have re-connected, for we have always kept in touch (with Christmas cards, occasional e-mails, school reunions) and when we were both living in Denver, we now and then saw one another and visited – and knew what was happening in our lives. Friends are always friends – whether or not we are in constant contact. Carol and her husband Richard have moved back to Denver near her daughter. Richard, whom I have also known for more than fifty years has Alzheimer’s disease and it is progressing rapidly. When I think of Richard, I especially remember his wit and humor and his tennis talent. Richard was a very very VERY good tennis player (could have probably been professional). These friends are two of my husband’s favorite folks to visit with – and I heartily agree with him. It is sad to think of Richard now enduring this insidious disease. It is heart-breaking to think of Carol’s heart breaking and the trials she has endured and is enduring as she fights Richard’s disease alongside him. God bless my friends as they travel this road. Lisa Snyder is a clinical social worker at the University of California, San Diego (UCSD), Alzheimer’s Disease Research Center (ADRC) and has written a book based on interviews with people diagnosed with Alzheimer’s. 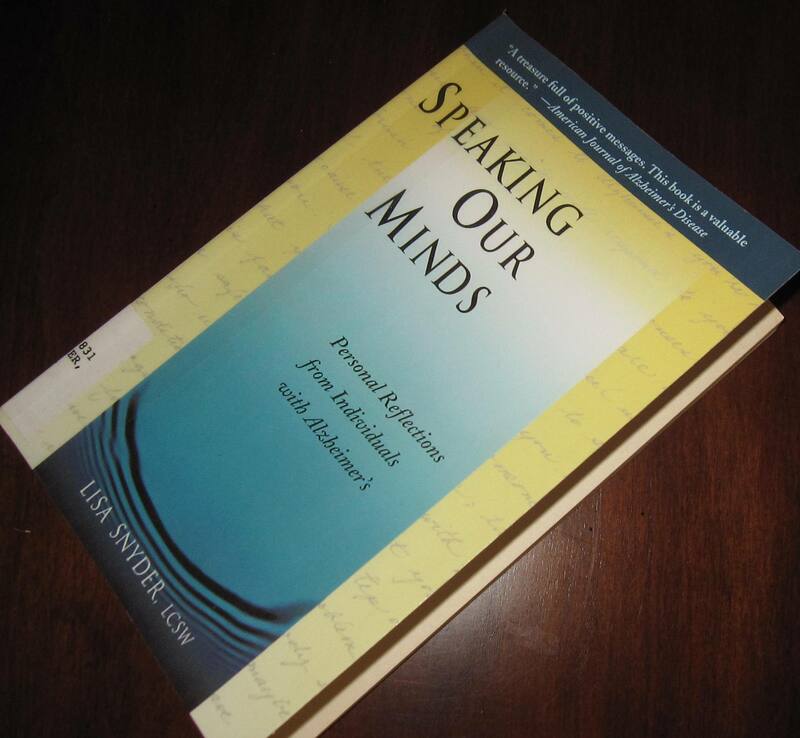 The interviews in her book Speaking Our Minds were taped in-home with Alzheimer’s patients who offered their reflections about the impact of the disease. He further writes that . . . Like the Gospels of the New Testament, these recollections attempt to recapture the essence of a loved one through a collection of the loved one’s words and actions. Like the Gospels, they are more the reflections and perceptions of the writers than the loved one. When placed next to each other, they do not always agree. They sometimes contradict each other. They do not all include the same words and events. It seems as though I have been finding more ‘new’ (that is new to me you understand) authors during the past few months. Tommy Hays is executive director of the Great Smokies Writing Program at the University of North Carolina at Ashville and creative writing chair for the Academy at the South Carolina Governor’s School for the Arts and Humanities. The Pleasure Was Mine takes place during a critical summer in the life of Prate Marshbanks, when he retires to care for his wife, who is gradually slipping away. Several years ago, I began following Chip Gerber’s Journal online but had not visited the site for some time. I’m tired today…so tired. I’ve been pushing myself, doing a lot. Going a lot and not getting my proper rest so a lot of it is my fault. I set limitations for myself but find it difficult to follow them. There is so much I want to do yet in life but Alzheimer’s Disease has changed my goals much and I can no longer do what I once did. I was diagnosed with the disease in 1997 and the long good bye goes on. Not that I mind. I’m not ready for Heaven yet, but there are days like today that I just have to slow down and rest up for tomorrow and what it may hold for me. It’s always a challenge but one that I accept. It’s always different but with the help of the good Lord, my wife, family and friends, I will press on. The Alzheimer’s Association has been a tremendous help to me also. Then there is my medication, Aricept, and my doctor. I must say I have some support system which I deeply appreciate. On days like this I am glad that they encourage me…cheer me on. I need it. I don’t want sympathy but I do need support and lots of it. This keeps me going and I have promised myself that with my last ounce of strength that is exactly what I plan on doing. There is life after diagnosis and I plan to do my best to live it. Note: Chip was diagnosed with Alzheimer’s disease at age 50 in 1997. A few days ago, my interest was revived regarding Chip Gerber and I did a Google Search (ah – googling!) in an attempt to discover where he is now, but the latest date on his “My Journey” blog was dated 2007. Then I read that Chip died last March (although he may not have been writing in his online journal a couple of years before his death). Chip Gerber was an inspiration to so many and certainly opened my eyes to many aspects of the Thief Alzheimer’s. God keep Chip Gerber in peace (and He will). a future of its own. Who is caring for who? Caring for someone with Alzheimer’s disease impacts every aspect of daily life. As Alzheimer’s patients lose one ability after another, caregivers face tests of stamina, problem-solving, and resiliency. During this long and difficult journey, communication diminishes, rewards decrease, and without strong support, caretakers face challenges to their own well-being. Maintaining emotional and physical fitness is crucial. Preparing and protecting yourself, working to understand your loved one’s experience, and embracing help from others can minimize the hazards and enhance the joys of your caregiving experience. Balancing the enormous task of caring for a cognitively impaired adult with your other responsibilities requires skill, attention, and diligent planning. Fortunately, many professionals and caregivers have developed a wealth of resources to help you prioritize your efforts and provide effective care. Planning for your own care is also vitally important. It is easy to abandon the other people and activities you love when you’re mired in caregiving, but you risk your health and peace of mind by doing so. Though your caregiver’s journey is full of the unexpected, learning to protect, reflect, and connect can reveal surprising opportunities to meet your needs and nurture your sense of satisfaction. When caregiving is difficult and over-whelming, you may feel totally alone. However, current counts suggest that as many as 10 million others are also providing care to someone with Alzheimer’s disease or other dementia! Maintaining social contacts, family connections, professional networks, and peer support is an important safeguard for your wellness and happiness. Sharing tasks, solving problems, and savoring the humor along your caretaking journey will let you return to a life filled with good health and cherished memories. Members of the Guadalupe Regional Medical Center Pastoral Care are raising awareness and money for Alzheimer’s. On Oct. 18 (today) at Central Park from 4-8 p.m., Jeremy Roy, Alexa Ray, and several other musicians will take the stage to raise money for the Alzheimer’s Association. Rhonda Robbins of GRMC Pastoral Care says the concert is to raise awareness, but they will also be accepting donations. Robbins said that a representative from the Alzheimer’s Association will be on hand to speak with people, and answer questions they may have about the disease. Alzheimer’s is a progressive and fatal brain disease. 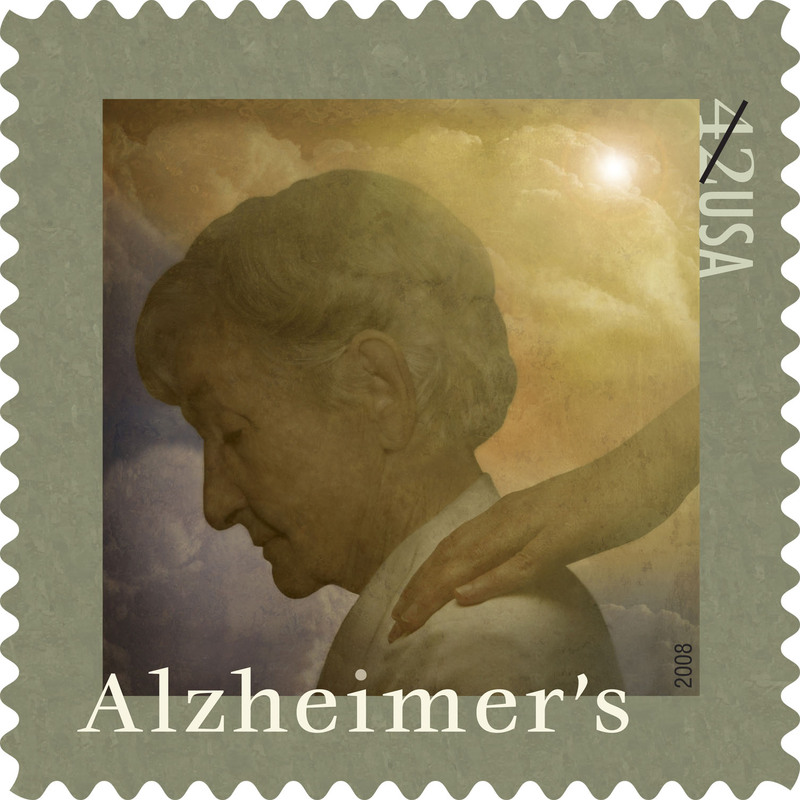 Currently about 5.3 million Americans suffer from Alzheimer’s. Robbins said over 35 million people worldwide are diagnosed with the disease, and that number is expected to double every 10 years. There is no cure for Alzheimer’s, but drug and non-drug treatments help with some of the physical and cognitive symptoms. When we first moved to Seguin, we met some very nice folks who became friends. That was more than eleven years ago. A few years later, friend David was diagnosed with Alzheimer’s disease and of course, our hearts were broken and our prayers for our friends are fervent and continuous. David’s wife told us that, along with several other medications, David has begun taking coconut oil/combination in his diet – which will hopefully alter the progression of the disease. What marvelous news! Wouldn’t it be nice if these dedicated scientists discover a cure for this terrible disease? However, medicines and diets that deter the agonizing progression of this Soul Stealer is hopeful. She pictured her own name on a matching headstone next to Anne’s. She’d rather die than lose her mind. She looked up at John, his eyes patient, waiting for an answer. How could she tell him she had Alzheimer’s disease? He loved her mind. How could he love her with this? She looked back at Anne’s name carved in stone. How Lisa Genova used the social media . . .